Japan’s Nikkiso Co Ltd has closed its acquisition of California, USA-based Cryogenic Industries Inc and Cryogenic Industries AG of Basel, Switzerland. Cryogenic Industries, which includes ACD, Cosmodyne and Cryoquip, has more than 40 years of experience in the engineering and manufacturing of cryogenic equipment including centrifugal and reciprocating pumps for industrial gas, LNG and energy markets. “The acquisition will strengthen our global presence through Cryogenic Industries’ strong position in North America. It will provide an excellent complementary fit for Nikkiso group’s global base for production, which will allow us to gain efficiency improvements and balance currency effects. As a joint group of companies, the setup will allow us to have customer focused centres around the globe that will be in position to support the entire range of Nikkiso group products” said Toshihiko Kai president and CEO of Nikkiso. “We look forward to working with Nikkiso to continue enhancing and expanding our global cryogenic technology offerings and realize opportunities in an aligned global group” said Ross Brown, chairman and CEO of Cryogenic Industries. Each of the branded companies will act as distinct entities with their own focus and targets, while Nikkiso will further develop the service, market and logistic synergies across all product groups and companies. “Our future profitable growth is assured by positioning our company in technology driven markets and the markets of the future. By combining the Nikkiso Group with Cryogenic Industries companies and the resulting global network of dedicated people, we will extend our position in our existing and target markets and be in position to achieve growth above the market rate,” said Naota Shikano, senior Nikkiso board member responsible for the Industrial Business Segment. 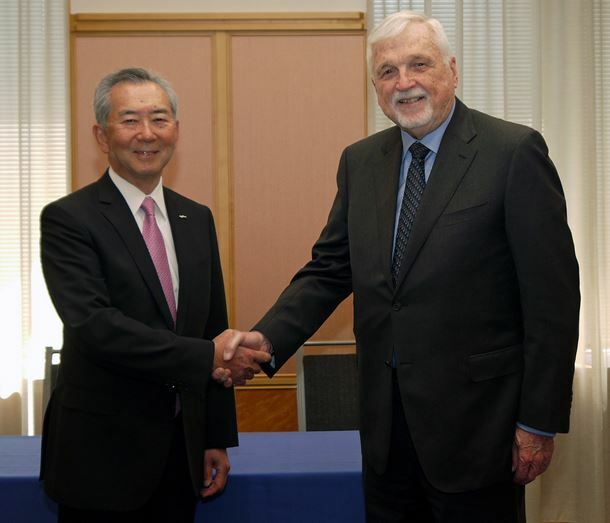 Toshihiko Kai (left), president and CEO, Nikkiso Co Ltd, and Ross Brown (right), CEO and majority shareholder, Cryogenic Industries, when the deal was first announced earlier this year.